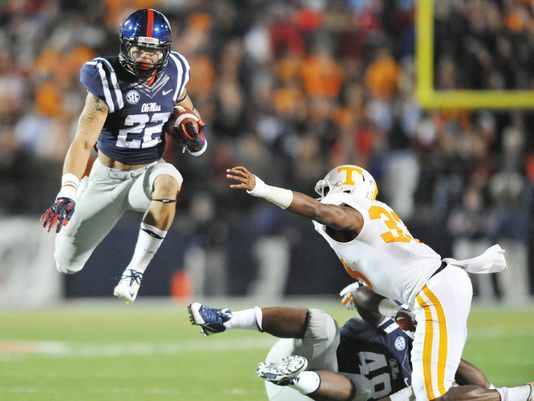 A slow start for Ole Miss was not a detriment for the Rebels, as they moved to 7-0 with a 34-3 crushing of Tennessee. Ole Miss was unable to get anything going on offense on their first three series as they gained a total of 4 yards and had three three-and-outs. Luckily for them the Volunteers were just as inept on offense and could not produce any points. The first quarter ended with the score tied at 0, but Tennessee moved the ball down to the Rebels’ 30 yard line on the final play. Tennessee eventually settled for a field goal and a 3-0 lead early in the second quarter. However, the lead would not last despite the best efforts of the defense. Ole Miss continued to struggle on offense, but soon broke out in a big way. On third and four, the Bo Wallace hit Vince Sanders for a 28 yard gain to the Volunteers’ 39 yard line. The duo connected on the next play for a 39 yard touchdown and Ole Miss led 7-3. The Volunteers luck began to run out on the following series. Justin Worley threw an interception to Senquez Golson. Five plays later, Jaylen Walton ran in for a 7 yard touchdown and a 14-3 Ole Miss lead. The Rebels would take that lead into the break after Gary Wunderlich‘s 52 yard field goal as time expired was no good. The third quarter began slow, much like the first half. It took a series of three plays for Ole Miss to effectively end the Volunteers’ hope. Wunderlich nailed a 34 yard field goal to make it 17-3. On the ensuing kickoff, Evan Berry was hit and fumbled with Ole Miss’ Marquis Haynes recovering the ball. The next play for Ole Miss was Wallace finding Evan Engram for a 28 yard touchdown pass and the lead was at 24-3. Ole Miss added another field goal on their first drive of the fourth quarter to extend the lead to 27-3. Tennessee would be stuffed for a four yard loss on fourth and one on their next drive to give the ball back to the Rebels. They ran the clock down, but scored with 31 seconds left on Mark Dodson‘s 8 yard touchdown run to reach the final score of 34-3. Justin Worley went 19 of 34 for 191 yards with three interceptions in a poor performance. The leading rusher for the Volunteers was Jalen Hurd with 40 yards on 13 rushes. Tennessee had 0 yards rushing on the game thanks to sack yardage being included in that stat. Josh Malone caught 5 passes for 75 yards to lead the team. Bo Wallace had a solid game by going 13 of 28 for 199 yards with 2 touchdowns. He did not commit a turnover in the game. He also ran 17 times for 33 yards. Jaylen Walton led the team with 60 yards and a touchdown on 10 carries. The leading receiver for the Rebels was Vince Sanders with 4 catches for 108 yards and a touchdown. Laquon Treadwell caught 4 passes for 43 yards. Tennessee (3-4, 0-3) continues to struggle against top competition. It does not get any easier next week with Alabama (6-1, 3-1) coming to town. Ole Miss (7-0, 4-0) has a big game next week in Death Valley. They face LSU (6-2, 2-2) next Saturday under the lights.